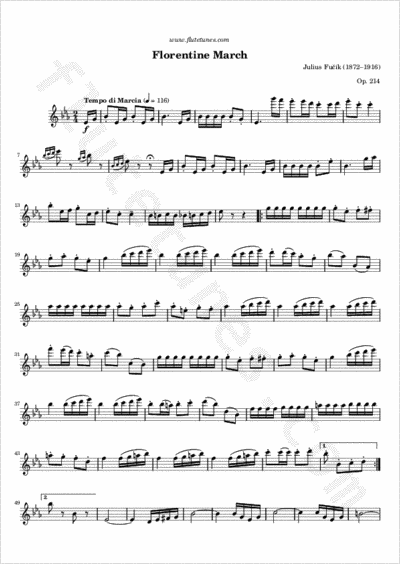 Although Czech composer Julius Fučík is best known for his march “Entrance of the Gladiators”, his real signature piece is this “Florentine March”, written during the composer's long stint as leader of the Royal and Imperial Army's military band. It's a happy, spirited piece in the vein of Johann Strauss's Radetzky March, and a standard selection on concerts of light band and orchestral music. The piece was composed in 1900 as a grand march for an opera never completed. Its original title was “La Rosa di Toscana” (“The Rose of Tuscany”), which was an appellation of the Tuscan city of Florence.